If the exhaust is faulty, you can be bothered by noise and also risk getting toxic fumes in the cabin. The exhaust ensures the emission of toxic exhaust gases away from the car, out the back into the open, hopefully without inconveniencing the next motorists. Is it time for an exhaust system repair or replacement? When your car starts making noises like a tractor when you start it, it's time to replace the exhaust. There is no question about this when you hear the deep rumble of free engine noise. You are a nuisance to everyone around you, but you also give the environment additional pollution when the spill occurs prior the catalyst. The exhaust system starts at the engine where there is an exhaust manifold directing exhaust fumes from the various cylinders into the exhaust pipe. The exhaust pipe goes from the manifold down and under the car. The exhaust system is divided into a number of components that may be changed individually if need be. The catalyst sits between the manifold and the muffler, usually at the beginning. The muffler sits out the back, just prior the last bit of exhaust pipe. The muffler’s purpose is to muffle the sound of engine noise before the cleaned exhaust gases escape into the open air. You can temporarily fix the exhaust with Gun Gum. There are several manufacturers of the product that use either a lubricating paste to rub in the corners, or cloth-like pieces (called repair bandage) to wrap around the pipe and rub paste only. Then the Gun Gum paste solidifies and becomes hard. It can easily last for quite a long time, and is a cheap temporary solution if you can do it yourself. Sort of like a plaster cast for your exhaust. The permanent solution is obviously better, and last longer. The exhaust is thankfully one of the parts of your vehicle that can be patched up quite easily. You can weld on a new piece, replace parts of it such as the exhaust pipe, muffler and tail-pipe when they become faulty, rather than replacing the entire system. The only thing you cannot repair is the catalyst which can only be replaced if it is defective. There are many garages that has the equipment to weld exhausts, either by mounting an additional piece, new parts or a patch. You just have to be aware if it is worth it in the long run, as the entire exhaust system tends to be corroded evenly, so patching it together over and over again may be more expensive than replacing the whole thing. At Autobutler you can contact your mechanic and book a repair or replacement for your exhaust system, you can also send documents and pictures so that your chosen garage can assess the extent of the job and quote you accurately. The exhaust manifold receives exhaust gases from all valves, combines them into one pipe, and transmits them through the front pipe. Suspension is used in several places, so the exhaust is kept in place, and doesn’t break. Rubber mounts are used in several places to reduce the impact of road imperfections, so they are not propagated into the exhaust. This prolongs the life of the exhaust. Coupling pieces can be used to connect pipes. Some pipes have pre mounted end pieces. Often the mid-pipe, muffler and tail-pipe are assembled in one piece, as shown in the picture below. If you want to give your car a more sporty look, you can fit a tailpipe, which comes in many different shapes and sizes to satisfy the flashiest of petrol heads. The catalyst is usually the first part of the exhaust system, so as to clean the exhaust fumes as soon as possible. The catalyst receives the toxic exhaust gases, and filters them so that the remaining exhaust gases is relatively harmless to the environment, atmosphere, animals and humans. If there are holes in the exhaust pipe after the catalytic converter, it is just going to be an annoying noise. The risk of toxic fumes in the cabin is reduced, but it will still be uncomfortable and possibly harmful. 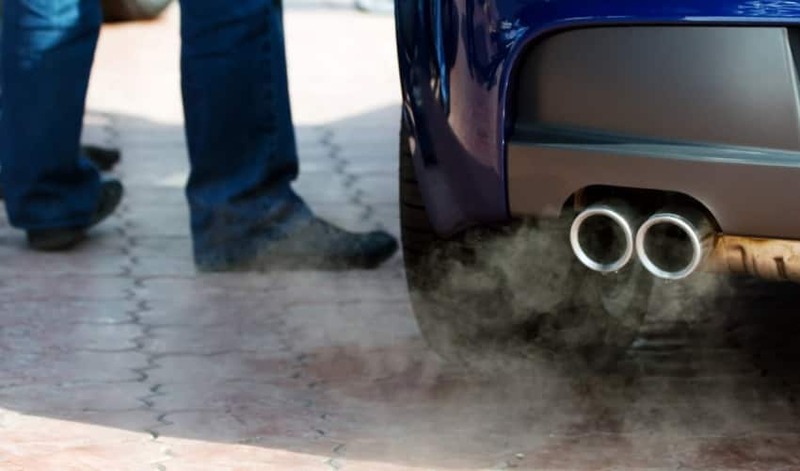 Exhaust gases are not dangerous, there are still rules for venting garages, but with the introduction of the catalytic converter the vehicle pollution is significantly reduced. MOT regulations for the exhaust is not that strict. The exhaust system may be patched and repaired in any way possible, and you may have created ​​your own exhaust pipe, muffler, etc..
You may also have retrofitted exhaust system with less resistance, so the engine can perform its maximum. * It must comply to the environmental standards for emissions.